Looking for a way to get the kids outside? Green tree houses are the way to go! Create a great backyard play structure that’s an outdoor playroom. Make it beautiful to look at and strong enough for the whole family to play on it. Spark the imagination and encourage kids to turn off the TV and computer, and go outside to play! Ms. Butler has created green tree houses for a number of famous clients, including Bobby McFerrin and Robert Redford. The play structures are “green” for a number of reasons. They are strong and durable, meaning that you will not have to replace them after only a few years. The tree houses are made from natural, renewable resources. Tree houses encourage children to play outdoors and use their imagination, enjoy nature, rather than remain plugged into electronics. 1. Use of Green Materials: Non-toxic, natural redwood that is not chemically-treated. The lumber is sustainable second-growth redwood from well-managed forests. The lumber is “air-dried,” instead of kiln dried. Wood stains are natural tung oil wood stains. Once dry, they are transparent and non-toxic. The stains are free of toxic fungicides and biocides that are often added to paints to prevent mildew growth and extend the shelf life of the product. Love these imaginative green tree houses! 2. Green Construction: When the tree houses are constructed and attached to a tree, arborist-approved methods are used to allow for dynamic movement, continued growth and continued health of the tree. Every structure is built to withstand the test of time. They can be repaired and remodeled for years. Building the tree house itself is done with great care so as not to harm the tree or its roots, or any surrounding vegetation. The “land speaks first,” meaning that minimal grading or clearing is done to construct the green tree house. 3. Green Design. 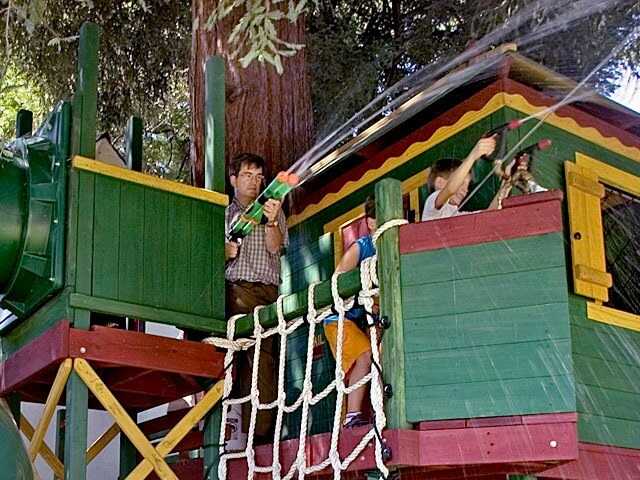 In general, an outdoor play structure like a treehouse is more environmentally friendly than an indoor playroom. It encourages play outdoors, recreation and exercise.The tree houses themselves are designed to connect kids with the environment. With ample windows, doors and skylights, the need for electricity is reduced or even eliminated. 4. Recycled Materials. The company’s operations are all conducted on recycled products, including paper, cardboard, bottles/cans, lumber, sawdust, ink and computer equipment. Leftover materials are reused, or reformulated. Even salvaged lumber and logs can be used in the green tree house design. Would you consider a green tree house for your child? Why or why not? Good Blog for Kids and information for Green Tree Houses. Great house design for your treehouse especially about coloring it green which is very creative and it’s eco-friendly. I can say that you have great design in terms of building tree house. There’s this site that also has great designs and sells tree house kits and kits for kids also (http://buildatreehouse.org). I truly am amazed with your house design. Greening Up those Kids all Summer Long! What is a Solar Power Purchase Agreement?